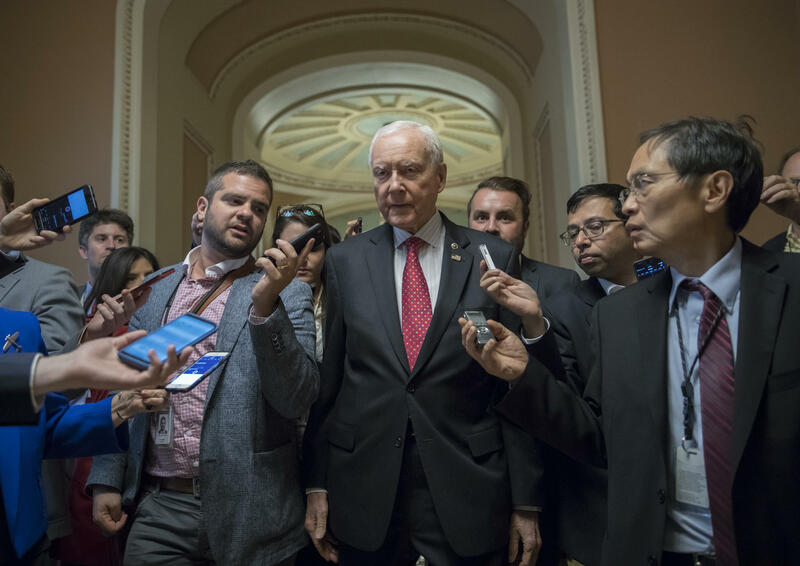 Senate Finance Committee Chairman Orrin Hatch, R-Utah, surrounded by reporters in the U.S. Capitol. The committee will hold its hearing on its tax bill next week. Senators aim to pass it out of committee before the Thanksgiving holiday. The Senate Finance Committee unveiled its version of a sweeping overhaul of the federal tax code on Thursday, as the House Ways and Means Committee was preparing to pass its own bill. The differing proposals forecast clashes between the two chambers that will make it difficult for Congress to enact the legislation by the end of the year as promised. The two bills share a name, The Tax Cut and Jobs Act, but diverge on tax policy that affects both the business and individual sides of the tax code. The Senate bill maintains the current seven tax brackets but adjusts the qualifying income levels and doubles the standard deduction for individuals, married couples and single parents. The bill also protects popular tax breaks the House bill wants to eliminate, including deductions for medical expenses and interest on student loans to pay for college. It maintains popular deductions for charitable giving and protects the mortgage interest deduction for current homeowners. It would maintain the threshold for deductions for future home purchases at $1 million, instead of lowering it to $500,000 as the House bill does. The proposal does not touch current tax protections for 401(k) retirement investments, and it does not repeal the individual mandate under the Affordable Care Act, although some conservatives and President Trump have indicated they would like to see that in the final bill. Like the House bill, the Senate version also bumps up the child tax credit from $1,000 to $1,650. The Senate version is also notably less generous to multimillionaires in at least one respect: While the House bill repeals the estate gift tax entirely, the Senate version doubles the amount that is exempt from taxation to $11 million. Both would eliminate the alternative minimum tax. Under current law, the Tax Policy Center estimates that about 11,310 individuals in 2017 will leave estates large enough to be affected by the estate tax, and that of those estates about 5,460 will ultimately owe taxes. On the business side, the House and Senate bills share a goal of lowering the corporate tax rate from 35 percent to 20 percent and grant a more generous system of deductions for smaller businesses, although the Senate version would delay the cut in the corporate rate for one year — against the wishes of President Trump. The overarching goal is to lower tax rates for U.S. multinational companies and make it harder to shelter profits overseas. Senate Democrats derided the bill as a reckless proposal that will add to the federal deficit and disproportionately benefit the wealthy. "How many million Americans will have to face a tax hike before Republicans give up their crusade to shower multinational corporations with multitrillion-dollar tax cuts?" said Sen. Ron Wyden, D-Ore., the top Democrat on the Senate Finance Committee. Democrats like Wyden, and some House Republicans, are particularly incensed by the elimination of the federal tax deduction for state and local taxes, a benefit that helps taxpayers in high cost-of-living areas like suburban New York and New Jersey. The White House continues to try to woo some Senate Democrats to support the bill, particularly those running for re-election next year in states Trump won in 2016. Top White House aides huddled this week with a group of Senate Democrats — and President Trump called in while traveling in Asia — but there is little public indication Democrats are warming to a tax plan crafted by Republicans. The Senate Finance Committee will hold its hearing on the bill next week. Senators are aiming to pass it out of committee before the Thanksgiving holiday. Across the Capitol, House Republicans were on track to pass their bill out of the Ways and Means Committee on Thursday. House Majority Leader Kevin McCarthy, R-Calif., said the bill will be on the House floor by late next week. Republicans have committed to getting a bill to President Trump's desk by the end of the year. The political pressure is mounting significantly on Republicans to produce at least one major legislative win in their first year as a governing majority in Washington. Republicans will have to navigate competing ideological, regional and corporate interests unlike anything their majority has faced to date. Their previous major legislative push, to repeal and replace the Affordable Care Act, ended in failure. Senate Minority Leader Chuck Schumer, D-N.Y., argued the tax bill would be a political loser for Republicans no matter what. "This bill is a lose-lose for them. They lose if they pass it. They lose if they don't pass it," Schumer said.